Golf fans who can make it to Milwaukee this month are in for a treat: the 2017 U.S. Open will be hosted at Erin Hills Golf Course on June 12-18, in Erin, Wisconsin — a 40-minute drive from downtown Milwaukee. While hotel rooms and Airbnb options near Erin are by now in short supply (in other words, if you haven’t booked a room yet, do it ASAP), one thing you can still plan is where to eat, drink, play and shop while in the region. First, get to know Erin (pop. 3,664). 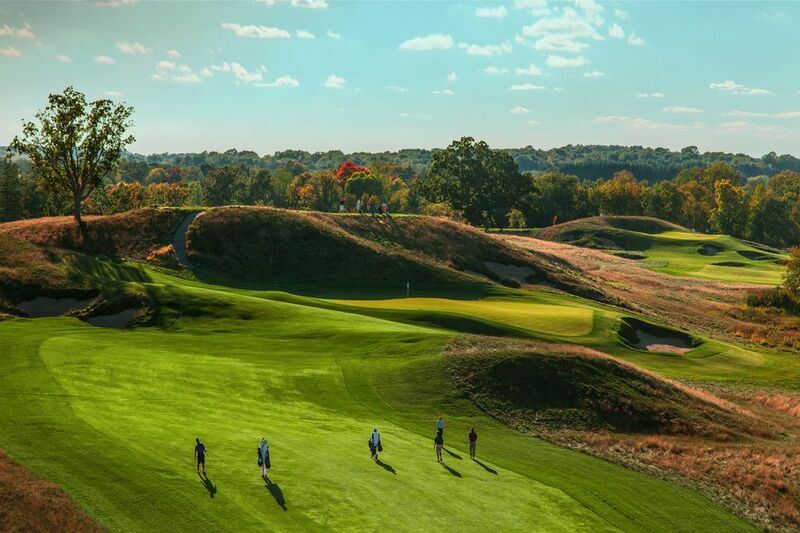 The small town’s most popular amenity is its 16-hole golf course, Erin Hills (http://www.erinhills.com). Tucked into a landscape of rolling hills, this course is what draws people to the area. When it was designed in 2004, the intent was to one day host a U.S. Open Championship. Located in Washington County, the nearest large city is Hartford with about 15,000 residents. Learn what’s going on in Washington County via this link. West Bend is Washington County’s largest city (pop. 31,000). Downtown West Bend—30 minutes from the golf course—is a cultural mecca with the Museum of Wisconsin Art as well as shops and restaurants. Erin is not far from the state’s best hiking area: Kettle Moraine State Forest, part of the Ice Age Trail, with bicycling and hiking opportunities galore in both the Northern and Southern units. If you're downtown, take a stroll through Lakeshore State Park, a 22-acre park behind the Milwaukee Art Museum and Discovery World. This urban park boasts amazing views of Lake Michigan’s shoreline. It’s also dog-friendly and the walking easy thanks to paved paths. Another nearby spot is Holy Hill in Hubertus, where from the spires of the namesake church you can see the entire region. This national shrine draws more than 500,000 annual visitors. It’s just 10 minutes from Erin Hills—you can even see the spires from any hole on the golf course. In the Third Ward, see Milwaukee from a new vantage point over drinks at The Outsider, the ninth-floor rooftop bar on top of The Journeyman Hotel, a Kimpton property that opened last year. Hungry? Former Top Chef contestant Heather Terhune’s food is available in the ground-floor Tre Rivali as well as at The Outsider. Another bar with a view (in this case, downtown Milwaukee’s skyline) is at The Yard at Iron Horse Hotel. This expansive patio features sectional sofas and sails to keep the sun out, along with classic cocktails and bites from Smyth, the hotel’s restaurant. Dogs are permitted here, in case your four-legged friend wants to come. Nine micro-breweries have popped up in Milwaukee within the last 18 months. A nod to that history is in the taps at the just-opened Pabst Milwaukee Brewery, on the same downtown land where Pabst was once brewed. New owners and brewmasters are using Pabst’s historic recipes over the decades. Communal tables and natural lighting in the tasting room are matched by an outdoor patio; nibbles like cheese and charcuterie platters are available, too. The Harley-Davidson Museum in Walker’s Point is an ode to the Milwaukee company that was started in 1903. The museum opened in 2008 on this 20-acre campus. Although riders get a kick out of the museum, many non-riders report that they are just as mesmerized with the design, history and adrenaline these bikes have. Hungry? The Moto Bar and Restaurant on site offers grub. And be sure to charge your phone because you’ll want to take a lot of photos in the museum, particularly of bikes through the ages. The San Diego Padres are playing against the Milwaukee Brewers at Miller Park (just a 15-minute drive west of downtown Milwaukee) June 16-18. Game dates and times are 7:10 p.m. on June 16, 3:10 p.m. on June 17 and 1:10 p.m. on June 18. You’ll quickly learn that Wisconsinites like to tail-gate pre-game; just keep your nose peeled for the aroma of brats on the grill. Haven’t had time to sample Wisconsin’s craft beers? No worries—there’s plenty poured inside the park.